I’ve been pretty frugal for a long time now, but we are slowly loosening the reins. I’m trying to be intentional about it so that it doesn’t get out of hand. With that being said, I think it’s important to be honest with yourself. Are you spending on things you truly value, or just telling yourself you are? Once you’ve reached big financial goals it can make sense to loosen the reins if you have the means to do so. It’s when you can’t make progress that you need to evaluate how much you really want your Wants. It is surprisingly difficult to discern this sometimes. I love these- I think the most important is the point regarding fighting with resources v. being a frugal team. This isn’t very easy even if you come into the marriage with a fairly frugal mindset. A good question to ask is if you respect your spouse’s desire to spend on X, even if it comes at a sacrifice of Y to you. Great point. We both have a frugal bent but have had plenty of disagreements about our finances. Communicating trust & respect goes a lot further than nagging and arguing. There’s no way around sacrificing in marriage. While we do a few things to save money (okay, many things), I do think that increasing your income can have a bigger impact on your finances than cutting costs. I’m pretty staunchly in the “make more money camp” and try to suggest practical ways to do so on my site. With that being said, notice I didn’t say “higher standard of living.” I certainly sacrifice some of my standard of living to increase my income. with that being said, I think you have to balance things. Right now we are really focused on paying down student loans, having money for renovations, saving, etc., so I think both my wife and I are willing to give up a little quality of life in the short term for a long-term better financial outcome. I certainly see from a numbers standpoint why increasing income can have more impact. I guess I hear the “it’s not working line” a lot from people who aren’t working either angle. Sounds like you are doing great from both angles! 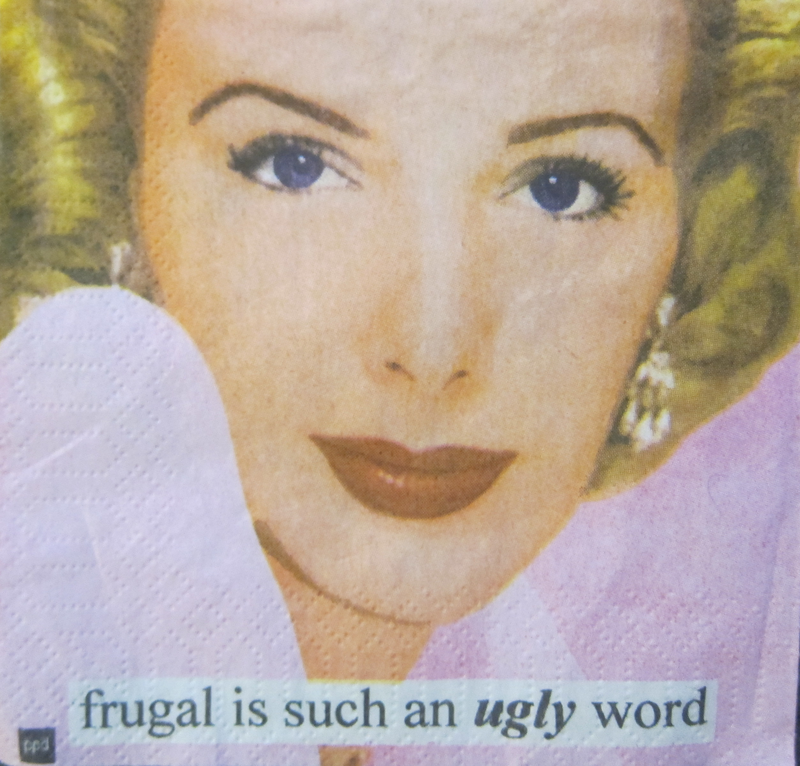 I was always under the impression that frugal was synonymous with cheap, penny pincher, boring, etc. I now know that’s not frugality at all. To me, frugal is just another word for intentional and directional. Thats’s what motivates us – to properly manage money so we can do more of the things we like and less of the things we dislike. Yes, that is a great definition of frugality. That’s definitely the purpose it serves for us as well. So now that I’ve realized I’m a frugal fraud, I guess it’s time to go all in. Thanks for the post. You can do it! It’s more about the mindset; the changes can come one by one. Well put! We’re fairly frugal but it took a while to get there. The biggest way was asking if we wanted or needed something before we bought it. That broke our mindless spending. Then we started with allowances for each other so we weren’t constantly asking “can I buy this?”. Then we started adding more and more into the “comes from allowance” category like, clothes, eating out, hobbies, and basically anything that doesn’t benefit the other person. This works well for us. While we may not be frugal in every aspect of our lives, we are frugal enough to hit our savings goals, and still feel comfortable with our lives. It’s allowed us to shoot for early retirement in a few more years, even if my wife gets laid off soon. Thanks for explaining your process of becoming more frugal. It’s different for everyone, but we can learn a lot from each other. That’s great you’re able to work toward early retirement. What a great post! One of my favorites has always been the person who is so excited about saving whatever% off a purchase without looking at the fact that they had to spend money to get that benefit. Often I find myself thinking “I can’t afford that” when in truth I do have the money I just have other goals. Trying to live off less and saving first really do help. I think there is a lot of power in realizing you could afford certain things, but that they’re just not worth the trade-off of bigger goals. This gets us a lot further than feeling deprived. That’s an excellent distinction you make. I particularly like “views spending as a way to save” vs. “views spending as something to minimize; actually puts “saved” money into savings” because it echoes one of my household mantras: Buying stuff we don’t need on sale does not save money! That’s definitely a helpful mantra, especially since there are so many ads and even whole television series devoted to spreading the opposite message. I never thought to draw the distinction between the two. Finding cheaper ways to inflate your lifestyle vs. deflating your lifestyle. Interesting concept that I think more people should consider more often! We didn’t think of that way for a long time, either, but it’s definitely helped us focus on bigger financial goals. I think people who are frugal are value-driven, wanting the best return on the dollar. Pretending to be frugal, without one’s “heart” in it is a waste of time and money. I’m afraid that pretend-frugality brings pretend-success! I agree that values are a big factor in true frugality from the “heart.” Well said. I think that everyone needs to read this post! I’ve never seen anyone break it out side-by-side like you did, and it’s so powerful to see it put this way. I do think that most “frugal” people are pretending at frugality (just this AM a whole bunch of “frugal shopping” posts popped up on Facebook), and aren’t really asking themselves the hard questions about what they really value in order to scale back their lifestyles. For sure we’re not perfect at practicing simplicity, but we get better all the time. It’s all about that journey, but this post really helps crystallize the differences for me. Thanks! We’re certainly not perfect at it, either! It really is about the bigger picture of which direction you’re headed, and if that’s actually where you want to be going. Love it! Pretending to be frugal is a short lived experiment. You can’t pretend to be something forever. Either you’re frugal or you’re not. Great point that you can’t maintain something if you’re just pretending. I think people can become frugal, but you have to pass the threshold from pretending. New to your site via Frugalwoods. Your content is great. Your title, “Pretend to be Poor,” makes me deeply sad. I wonder why you would choose it. Because a lot of people ARE poor and don’t need this. Please check out our welcome post, pretendtobepoor.com/welcome/, which explains the proverb we took our title from, its tongue-in-cheek tone, and our practice of charitable giving to the truly poor. Tongue in cheek time at the expense of how genuinely poor people would feel to come across your blog, sorry, that dog won’t hunt. I did read your religious explanation, and I think you’re over estimating how many people on reading your blog, would get the reference or the joke. And again, when the joke is on the poor, I just think it’s unnecessarily (if unintentionally) mean spirited. I worked with the real poor for years, it hurts to be poor. And they don’t think it’s funny. Just contributing honest feedback. I absolutely love the name of your site; it resonates with me on more than one level. I had not previously read your Bible verse reference, and I like that connection as well. After reading that, I actually shared your site and the verse from Proverbs on G+ and Twitter! As an aside, I was so poor years ago that I was homeless, and my first major “step up” was a welfare/AFDC check. It was instinctive to me that it would serve me to always “pretend” to have less than the reality. What a great post. I agree that many people are pretending to be frugal (I was very guilty of this, and still am guilty of this on occasion). I like you pointed out that you have to ready to evaluate and change every line item in your budget; not to leave anything off of the table. Only then, can you really make changes in your lifestyle and relationship with money. I’m sure we’ve all failed at frugality at times. But getting a clear picture of your spending really helps! Kids clothes are so cute–I understand the temptation. That’s great that you’re debt-free! Kalie (and Neill) — This is a remarkably insightful post. I have never thought about it this way. Thank you for sharing all of your insights. As a fellow Christ-follower, it’s a blessing to read someone in the “FI World” writing from an explicitly Christian perspective. I found your blog via Our Next Life’s blogroll, and I’m so thankful I did. Thanks, Mike! Glad you are enjoying it. I don’t think I’ve ever read a post about this concept. Well done! I think I’m crossing a line into the “Pretend to be poor” camp. My brother was expressing concern to me about my plans for “early” retirement. “You’ve been scrimping to get out of debt, but think about the lifestyle you’ll want to live in retirement,” he urged. I was struck by the fact that I don’t feel like I’ve been scrimping and saving. My (relative) frugality is my new normal. And I’d be happy to live my retirement years in it. The story about your brother is neat because it shows just how much you’ve changed and deviated from what your family (or society) views as the norm. That’s great too that you’ve found new normal that feels like an entirely reasonable and comfortable way to live long-term.